What a joy it is to receive a book written by Glenda Millard! 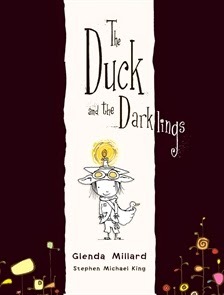 I've read and loved Isabella’s Garden and For All Creatures but now recently published children’s picture book The Duck and the Darklings has become my new favourite. Why? Partly it's the sheer poetry of Millard's writing. She chooses the perfect word for the perfect sentence, and then does it again and again. Partly it's the takeaway message, the splendour and hope of renewal and new beginnings for all who live for the feel of wind in their wings. Children need positive messages about their world and heroes like Peterboy and Grandpapa to fuel their dreams. Then too, it's the inspired choice of Stephen Michael King as illustrator - I love his limited palette for the darklings' home, and the gradual introduction of colour as hope increases in the story. Children fed a steady diet of wonderful literature like The Duck and the Darklings will grow up to love words, and love the way they play upon the strings of our hearts. Please read this book to your kids and your students, and then read it over and over again. It's that good.